When Tony Abbott became prime minister, he immediately went about implementing his policy of “turning back the boats”. This was in the face of warnings that the practice would not only cause a major diplomatic rift between Australia and Indonesia but the very real possibility of a neighbourhood konfrontasi. History shows that despite the rhetoric, Indonesia caved-in and accepted the boats being sent back. In doing so, the people smuggling business collapsed, heralding a significant victory for Abbott and his new government, while leaving some 14,000 refugees and asylum seekers stuck, mostly in Java. Several conservative commentators believe Scott Morrison should adopt the same model with Indonesia in the current stoush over the Israel embassy issue. The president and the vast majority of Indonesia’s population hold the Palestine issue close to their hearts. In essence, this means ignoring Indonesia’s complaints about the Australian government’s proposal to move its embassy from Tel Aviv to Jerusalem and Jakarta’s refusal to provide a final sign-off on a bilateral trade deal. Sure, there would be screams and howls from Indonesia, along with Labor and sections of the media. But by playing hardball, so the thinking goes, Morrison could end up “winning the day” and give his reputation, as a tough negotiator who sticks-up for Australia on matters of sovereignty, a much-needed boost. Yet would a hard-line approach work again? To answer this question, it is important to understand why Indonesia submitted to Abbott’s plan so meekly, despite the initial threats and anger from Jakarta. In some respects, Australia was lucky. The people smuggling trade in Indonesia was not of interest to most people there and it rarely received a mention in the daily media. Importantly, then President Susilo Bambang Yudhoyono (SBY) was nearing the end of his term and was widely seen as a significant disappointment domestically. His ratings had collapsed and his failures in terms of the economy and protecting religious minority groups was damaging him during his last months in office. SBY’s one asset was as an international statesman, where he was widely liked and admired. The last thing he needed was a major confrontation with Australia as he prepared to leave office. Apart from that, SBY and his wife Ani liked Australia, despite our intelligence agencies spying on his wife in 2013. Yet crucially – and Indonesia has refused to acknowledge this – SBY knew that Abbott’s policy of turning-back-the-boats, would actually do Indonesia a favour. As I wrote in The Australian in January 2014, the flow of asylum seekers to Australia’s north was happening as a result of Indonesia being the major transit point, rather than a destination. If Australia stopped the boats, then asylum seekers would stop travelling to Indonesia. Abbott read the signals well and won an important victory for Australia over its northern neighbour. With the election of Joko Widodo as Indonesia’s new president, the bilateral relationship changed significantly. Jokowi – as he is affectionately known – was far more domestically focussed, had very little knowledge of, or interest in, Australia. He directed Indonesia’s attention north to the truly large economies of Asia, and also into Europe, and North America. After all, Indonesia, a nation of 265 million people and, has an economy equal to that of Australia and growing fast. The relationship with Australia did have its upside with high-level co-operation in defence, anti-terrorism, policing and business-to-business. Yet despite the warmth, for much of Australia’s population, Bali holidays aside, Indonesia was, and still is, viewed with a high level of cynicism, suspicion, and ignorance. So, Morrison will need to rely on several factors to escape the embassy debacle with the trade deal with Indonesia intact. First, he will have to hope key personalities in Indonesia’s political system can have an influence in favour of Australia. Indonesia’s trade minister, Enggartiasto Lukita wants the Indonesia-Australia Comprehensive Economic Partnership Agreement trade deal concluded. Indonesia’s finance minister, Sri Mulyani Indratwati, who formerly was managing director of the World Bank, emphatically wants the agreement finalised as she battles a falling currency, a negative trade account of nearly US $2 billion last month, and a lack of confidence by investors in Indonesia. Mulyani and Jokowi need this deal to demonstrate that Indonesia is “open for business”. Yet Indonesian public opinion will also matter. The Israel Embassy issue would, unlike Abbott’s “turn back” policy, be of more significant news in Indonesia. The president and the vast majority of Indonesia’s population hold the Palestine issue close to their hearts. With an election coming up in 2019 – where Jokowi will need the support of his own hard-right Islamist vote – if he was forced to damage Morrison to demonstrate his strength as a leader, he would reluctantly, but almost certainly, do it. 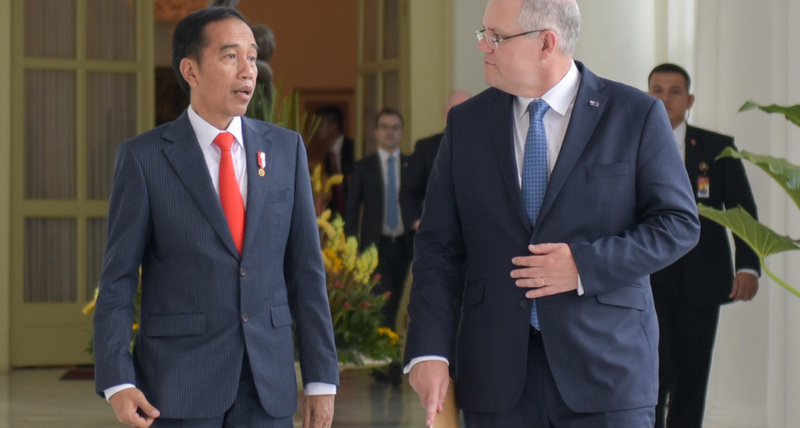 In Morrison’s favour, Jokowi’s rival in the presidential elections Probowo Subianto – anxious to demonstrate a statesman-like rationality – has stated he would not oppose Australia moving our Israel embassy to Jerusalem. He has called it a matter of Australian sovereignty. Morrison has pledged to make the call as to whether he proceeds with relocating the Australian embassy to Jerusalem by the end of the year. He could choose to further defer any decision and hope the issue just fades away, but having damaged his personal reputation in our region. In the meantime, irrespective of the outcome of this issue, it will only reinforce the generally negative perceptions of Indonesia by the majority of Australians at a time when Indonesia is becoming ever-more important. It’s clear Russia conducted a significant and wide-ranging information operation targeting the US election, using a variety of cyber and traditional propaganda tools.